“Where the hell’s Fiji?” is what Marlon asks his best friend Truman (Jim Carrey) in ‘The Truman Show‘ (1998) in response to his pal’s admission to having itchy feet. He goes on to explain where the South Pacific Ocean country is using his golf ball showing that you can’t get any further away before you start coming back. It is perhaps a little sad that this short conversation stuck in my mind and alerted me to the idea of one day visiting Fiji. Little did I know that just a few years after watching that film I would be visiting the place on the back of 15 months backpacking around Australia and New Zealand. Thanks to the journal that I kept at the time it is now possible to recall the events of that experience…. 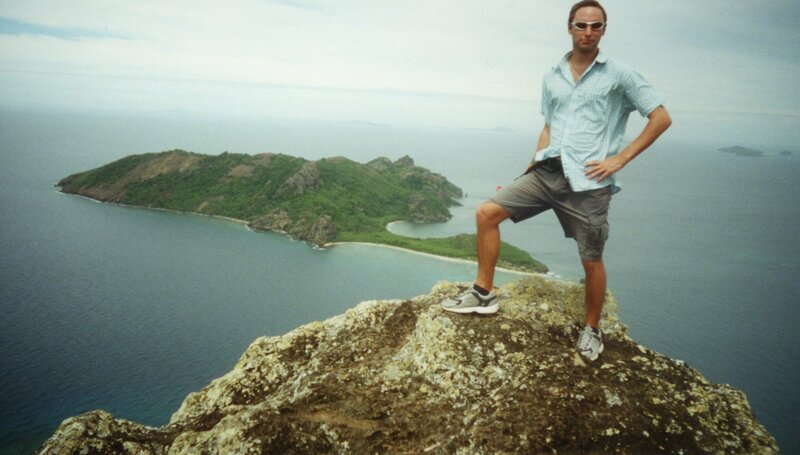 When I arrived in Fiji I didn’t really have a clue what I was going to do. I had a slight inkling of what I wanted to do but whether I did that would be dependant on how well I could organise myself. Thankfully, I didn’t have to make too many tough decisions – I just chose the two islands I wanted to go to, and the travel agency did the rest booking my accommodation and transport to and from the islands. Despite initial reservations and knowing the lady was on commission I just went with the flow and was ultimately very satisfied with my Fiji experience. First up was the more traditional cultural Wayalailai in the Yasawa Islands which was reached via a very small boat with a few repairs beforehand (not the greatest way to install confidence before you take to the sea! ), a few stops along the way to exchange all sorts of stuff with other boats and to re-fill with petrol and whatever else needed to be done to get us there. Wayalailai didn’t initially meet my own visualised images but as is so often the case it didn’t take too long to settle in to the village way of life despite the indifferent weather and a few dodgy meals. Talking of which, Kava is the traditional Fijian recipe that looks a bit like muddy water and one day I aided local Fijians in crushing its tree roots to supply our village. It was drinkable and had a slight sweet taste but not something I wanted to regularly drink. Mind you, I did have about eight drinks of the stuff hoping that it would do as I’d been told and make me sleepy ensuring a good nights rest. It didn’t! A high percentage of all us backpackers tended to mix with each other a fair bit (as was the case with everyone in Fiji) which was probably due to the universal meal times and little else to do after dinner other than sleep. Overall, Wayalailai provided me with a good, unique introduction to the country including a few pleasing activities such as a guided hike up the islands summit and the highlight was snorkelling on the ‘Around The Islands’ boat trip. The absolutely beautiful Octopus Resort at Likuliku Bay on Waya Island had lovely sand and amazing coral to snorkel around for a couple of hours and with the sun out more than usual, nearly everyone in the group of about a dozen got burned with my back catching particular attention from the suns rays! A strong proportion of us backpackers turned up for the village church service one day albeit for differing reasons. Mine was just for something to do and to kill a bit of time as true to form the sun wasn’t out and as the reverend was conducting it in the local language I didn’t feel any pressure to listen. The females and males were split onto different sides of the altar with some local village girls in front of the former and the children’s choir ahead of the latter. Theybelted out a few songs at the top of their voices to a point of almost shouting and the reverend then gave a sermon at what seemed like a hundred miles an hour only pausing for a few hymns which momentarily broke his momentum along the way. 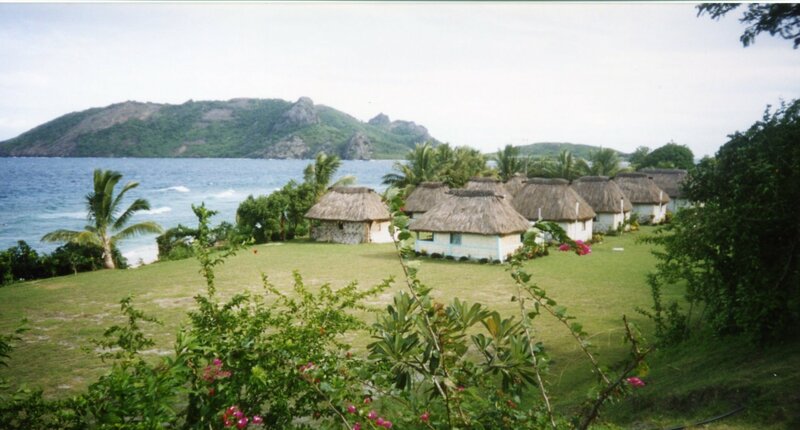 My second island; Mana in the Mamanuca island group, was more resort-like and therefore comparatively different. Unlike the Wayalailai boat, this was a proper cruise ship and en-route we sailed near one of the islands used in the Tom Hanks movie ‘Cast Away‘ (2000). I had an excellent few days on Mana with some good people and in hindsight was glad to have gone there after the more cultural Wayalailai. Mana island was more of a holiday within a holiday with a daily diet of sunbathing, swimming, reading, eating, card playing and drinking plus the bonus of a yacht party which was the only thing away from the usual routine. At about midnight one evening, two Aussie guys invited everyone on to their yacht for a party so having bought some beers, about 30 of us were transported out to the yacht via many motorised dinghy shuttle runs. On board there was music, drink and the chance to go night swimming. It continued for about three hours when we all had to be shuttled back to shore having felt privileged to have experienced, what for most of us backpackers, was a unique event. On top of that, a one night return trip to the Coral Coast (via a school bus and hitch-hiking) in the mid-south of the main island provided the adventure and potential for crisis which is something part of me thinks is brilliant to do while travelling. Truman said in the aforementioned movie that there are still islands in Fiji where no human has ever set foot but not surprisingly I only encountered three of the most popular ones among the 300+ islands which make up Fiji. Of course I feel privileged to have had the chance to visit this ethnically diverse former British colony in the Pacific. 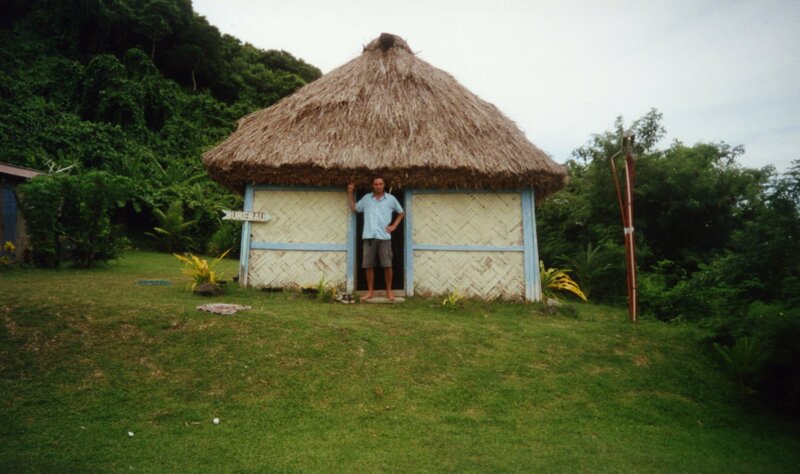 This entry was posted in Australasia Travel and tagged Fiji, how to make kava, Likuliku Bay, Mamanuca Islands, Mana Island, Octopus Resort, The Truman Show Fiji, Waya Island, Wayalailai, Yasawa Islands. Bookmark the permalink.